Whenever the word “shipwreck” is mentioned, many of us immediately think of Rose DeWitt Bukater and Jack Dawson, two star-crossed lovers aboard a doomed ship, with Celine Dion’s dulcet voice screeching in the background about how her heart will go on. As much of a masterpiece as we all believed Titanic to have been (although watching it again almost 15 years later may really change your opinions on the matter, but that’s neither here nor there), there are numerous wrecked ships off the coast of the Western Cape that offer us a real glimpse into the magnitude of such a tragedy. We have compiled a list of these wrecks so that next time you go cage diving in Gansbaai or for a drive along the Oceanside, you’ll have something different to look out for. 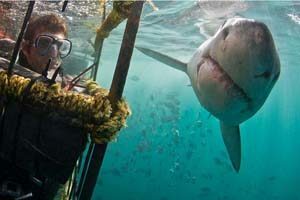 Danger Point, previously known for its treacherous, rocky terrain, and these days as an ideal spot for great white shark cage diving, is the sight of one of the most infamous shipwrecks of all time. In 1852, the HMS Birkenhead struck the rocks just off the coast, resulting in the death of almost every male passenger on board. It was at this site that the term “women and children first” was initially used. Every women and child was spared. In 1815, The Arniston, an East Indiaman ship wrecked at the Waenhuiskrans during a terrible storm. There were 378 souls on board, and only six survived. The little village of Waenhuiskrans became so widely associated with this shipwreck that it later became known as Arniston. In 1682, a gold laden ship named Joanna wrecked very near to the coast of Cape Town. At least ten people drowned in the wreck and 104 made it safely to Cape Town. The wreck lay untouched for almost 300 years until it was discovered in 1982 near Quoin Point. In 1799, the HMS Spectre was caught in a storm while anchored close to Cape Town. The anchor was tugged along, eventually wrecking on a reef near what is today The Royal Cape Yacht Club. Of the 400 passengers on board, only 50 survived. More recently, in 1942, the SS Thomas T Tucker ran aground when the Captain misjudged the distance from Robben Island, and was sailing too close to the coast. The ship now lies in three parts along the Oliphantsbos Beach within the Cape of Good Hope Nature Reserve. It was later discovered that the ship’s compass was at least 37 degrees out. These wrecks have enabled insight as to the necessary security measures needed in order to prevent such tragedies from happening again. Lighthouses and sea/land communication tools and methods have increased significantly, thus minimising the frequency and the impact that such incidents may have. Whenever you see one of these wrecks off the coast of the Western Cape, do spare a thought for all the lives lost, as well as those who were able to rescue some of the victims. It is because of them that tragedies like this can now be avoided.